From 2010 through 2014, WFSU was a part of an interdisciplinary collaboration between Dr. Randall Hughes and Dr. David Kimbro, ecologists working at the FSU Coastal and Marine Laboratory. That collaboration resulted in dozens of short videos and two documentaries that took a detailed look at the salt marshes, oyster reefs, and seagrass beds of Florida’s Forgotten Coast (and beyond). In the Grass, On the Reef also gave a rare glimpse into work that goes into being a scientist, from reworking experiments, altering gear for new uses, mobilizing teams of students and lab technicians on large field experiments, dealing with unfavorable weather, and more. Drs. Hughes and Kimbro, along with their grad students and techs, documented their years of work on Florida’s coast through blog posts. In the Grass, On the Reef evolved into the WFSU Ecology Blog, which takes a wider look at the outdoors of north Florida and south Georgia. In the Grass, On the Reef was funded by the National Science Foundation. So what are those colorful chips at the top of every In the Grass, On the Reef article? If you like eating wild caught seafood, bird watching along the coast, or even if you just live by the coast, you are receiving benefits from healthy ecosystems such as oyster reefs, salt marshes, and seagrass beds. What we’re doing on this site is looking at how predators affect the health of these habitats and the services they provide us, whether it’s clean water to swim in or a beautiful painting inspired by the lushness of the natural setting. The diagram below illustrates these relationships between the different plants, animals, and different factors like biodiversity, on the services we enjoy. Click on the icons below to see every article on the topic that each icon represents. 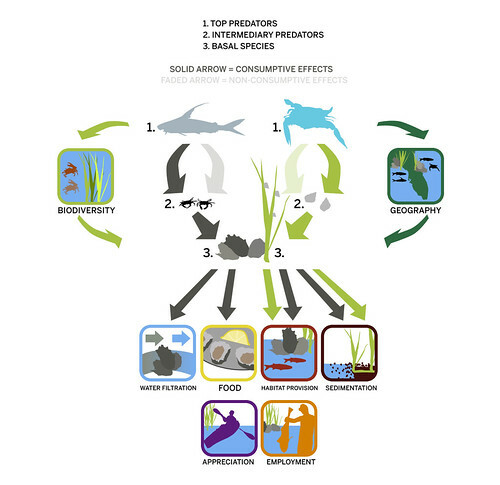 (1) Predator Effects: How do top predators like large fish and crabs (top of the diagram) affect intermediate consumers (the small crabs and snails in the middle), and how do these effects of predation influence the basal species (oysters or salt marsh plants)? We’re looking primarily at oyster reefs and salt marshes, which share many of the same species and are often found next to each other. The chip to the left condenses the action on the oyster reef side of the central diagram, to make it easier to fit onto individual posts. (2) Non-Consumptive Effects of Predators: Are effects of predation due to top predators eating their prey (dark arrows) or due to top predators scaring their prey (light arrows)? This idea of consumptive (eating) and non-consumptive (scaring) effects of predators is also illustrated by the 2 icons at the left (which will be the images placed on posts) – in one, a fish is actually eating a mud crab on the reef; in the other, the presence of the fish alone can cause the crabs to behave differently. a. Water Filtration: Filtering nutrients and algae from the water. This service prevents algal blooms that harm seagrass beds, thereby allowing the beds to provide Habitat Provision as a service. This chip will be used for posts relating to water filtration, filter feeding, phytoplankton, and algal blooms. Note- There are no posts yet regarding filtration. b. Providing Food for Humans: Providing culinary delight. This chip will be used when discussing species as food for humans (as opposed to prey for predators). When we discuss species as they live in the habitats, or their behaviors and characteristics, we will use the Habitat Provision chip. When we talk about the people who fish or harvest the species, we will use the Employment chip. c. Habitat Provision: Providing habitat for lots of fishes, crabs, and other invertebrates. By doing this, marshes, oyster reefs, and seagrass beds support fisheries, providing food and jobs. This chip will be used not only in discussing the habitats as homes for species, but in discussing the behaviors and characteristics of the species. d. Sedimentation: Preventing erosion by stabilizing sediments. Note- There are no posts yet on sedimentation. e. Appreciation: Promoting tourism and enjoyment of coastal areas. We explore this area in our EcoAdventures North Florida posts. f. Employment: Providing a livelihood for commercial fishermen, people who work in ecotourism (like kayak guides), seafood restauranteurs and their employees- not to mention researchers and nature documentarians! This chip will show up on posts dealing with the job of being a researcher, grad student, lab tech, etc., as opposed to the actual research they do. And of course it will be used for commercial fishermen or anyone else making a living on the coast. It’s important to note that these are just a subset of the many services that these habitats provide; we’ve selected them because they are the ones most often investigated in our research and/or discussed here on the blog. (4) Biodiversity: What are the effects of species or genetic diversity on predator-prey interactions or ecosystem services? We know that marshes and reefs differ in the number of plant species, or the number of fishes and crabs, and so much of our work examines how these differences affect the quality and productivity of the habitat. (5) Geography: How do all of the ecological processes that we’re interested in change as you travel from one area to another, whether it is 1 mile or 100 miles? There are two reasons why it is important to test things in more than one location. First, we want to learn how consistent our results are – if something happens in one place but not in another, then it may not be relevant to the big picture of how these systems work. And second, we want to be able to make some predictions about how our results may apply under other conditions. By taking advantage of natural changes in tidal patterns in the Gulf of Mexico, or temperature as you move up the Atlantic coast, we can increase the generality of our findings. Each post that we do from now on will have one or more of these icons at the top that will link you back to where that post fits within this broader picture. We hope that these icons will draw your attention to the over-arching goals of our research and the interesting commonalities between In the Grass and On the Reef. Plus we hope you think they look nice!